In this case, horsepower is just the icing on the cake. Fun as Volkswagen’s Golf GTI is for a weekend romp down the local winding gearhead hideaway, it’s not the first car you’d pick when going against a full-fledged sports cars like, say, the BMW M4. It’s light and spreads its 220 horsepower budget thoroughly, but on the race track, the highly limited 350 horsepower Golf GTI TCR is the better option. That’s no longer the case. 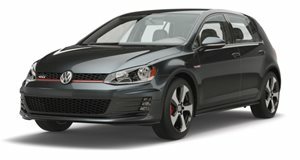 Now, if you want a more powerful Golf, there's the highly limited Golf GTI First Decade. By highly limited we mean it's a one-off GTI that's set to be shown at the annual “Worthersee GTI treffen” (Wörthersee GTI meeting) in Austria and represents the completion of a nine month project for a team of young apprentices from six separate vocations. These young wiz kids endowed the Golf GTI First Decade with 404 horsepower going to the front wheels via a gas engine. Apparently that wasn't enough because the GTI is supplemented by a 48-volt electric motor spoon feeding the rear wheels with up to 16 horsepower, making this the first Golf GTI with electric propulsion. The GTI First Decade can be powered by each powertrain individually or use both at the same time, giving it the benefits of an electric car when fuel efficiency is needed. When the roads get rough or if the driver takes it to a track, both systems can be switched on simultaneously via a tablet PC or on the infotainment display to allow the use of all four wheels for maximum thrust. Other highlights include contrasting shades of Atlantic Blue Metallic on the body and Satin Ocean Shimmer laid onto large sections of foil on the doors and rear side panels. A rear spoiler is thrown onto the back end and 20-inch alloy wheels fill the wheel wells. Inside, the two-passenger GTI gets new sports seats that can be controlled electronically using a smartphone or tablet app. The inbuilt massage function also seems like a great way to avoid fatigue when opening the 404 horsepower floodgates on long winding roads. When the GTI First Decade isn't being driven, the titanium black nappa leather and Alcantara interior combination, which features contrasting blue stitching, can be enjoyed. Audiophiles are certain to love the high-end 12-speaker, 1,690 watt sound system. Less exciting but equally impressive is the second Golf premiere at the show, which is called the Golf GTE Estate implusE. Built by 14 apprentices, this electric car features a battery that’s had its capacity doubled from 8.8 to 16.8 kWh, also doubling the vehicle’s range. A five-tone matte paint job that includes shades of Oryx White, Apassionata Blue, Anthracite, Hallmark, and St. James Red gives this Estate a singular appearance that’s easy to fall in love with. The disappointing news here is that both cars are one-off models that are extremely unlikely to see the inside of customer garages, but at least we know it’s not for lack of ability on Volkswagen’s end. Heck, even the apprentices could do it.